Hamilton Extra Long Shotgun Slip Stand. The all new Hamilton SlipStand provides shooters with a feature rich and practical accessory, designed solely to increase gun protection, gun safety and user convenience. Keep your kit off the floor, out of the dirt and mud, makes slipping your gun easier, safer and saves your back, no bending! The Hamilton SlipStand is built to be carried on the shoulder like a conventional gun slip but it also features a lightweight integrated pop out stand that extends automatically when you place it on the floor. A Water Resistant Layer - The outer fabric is durable and easy to clean and in conjunction with the Polyethylene layer ensures your gun stays dry. However for extra repelling properties it can be treated with a waterproofing agent like "Nikwax TX.Direct Spray-On". Tough Polyethylene Layer - This layer surrounds your gun and protects from falling clays and piercing objects. It adds rigidity to the bag and resists damage from crushing. Shock Absorption Layer - Unlike some conventional slips that use only flocking, wool or fur to stop your gun from scratching, we have included a half inch layer of shock absorbing open-cell polyurethane foam that provides an effective shock absorption layer. Soft Anti-Scratch Layer - Finally we finish the quad layer system with a super-soft dark fur flocking which covers every surface of the slip internally. This ensures your barrels, action, forend and stock will not suffer from friction related wear. Keep your kit off the floor, out of the dirt and mud, makes slipping your gun easier, safer and saves your back, no bending! 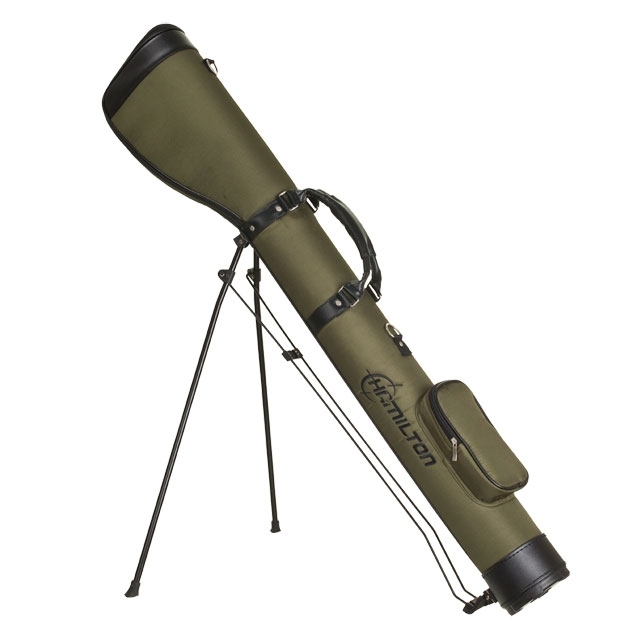 The Hamilton SlipStand is built to be carried on the shoulder like a conventional gun slip but it also features a lightweight integrated pop out stand that extends automatically when you place it on the floor. What does this mean for you? Did you know, on a 60 bird clay shoot, the average shooter bends over to pick up or put down their slip and gun over 30 times? Think about it, you arrive to your stand and place your gun on the floor. It’s now your turn so pick up your gun, we’ll assume you’ll throw your slip down at this point. After your turn you’ll pick up your slip and put your gun back in it, now you’ll put your slip and gun back down whilst the other shooters take their turn. Ready to move onto the next stand, grab that slip and gun! Never get caught out in the rain with our universal umbrella fixings *(Shotgun version only). Store accessories like chokes, snap-temp3caps, cleaning equipment etc in our large size storage pocket. The heavy duty grab handles make transporting your gun easy. Carefully balanced to ensuretemp2 the gun remains level and doesn’t twist your wrist, the grab handles make it easy to remove your kit from your car or to quickly move your Slipstand. A double strap system has been introduced for 2016, you’ll still have the option of using the standard carry handle or sling it on one shoulder, alternatively you can use both straps for “back pack” style use which is incredibly comfortable. The new strap also sits the case horizontally across your back to stop it from bashing the backs of your legs when you walk (this means the case is perfect for shorter shooters and children). Every Shotgun case features a choke organiser pocket at the top of the case within easy reach. This has elasticated pockets to keep temp1your chokes ordered by size so you can grab the correct one without having to check the markings. The top of this pocket (when unzipped) also becomes a table, so you have a handy space to temporarily place your swapped out chokes and key, freeing up your hands to make changing chokes less fiddly. In many European countries, it’s a legal requirement to be able to lock your gun case whenever you’re not on the shooting ground. Therefore we’ve added the ability to use a padlock to secure the zippers together. temp5 We also increased the gauge of the zips for 2016 so they’re stronger and easier to open and close! I already had the shorter version but needed a longer one for a longer sporting shotgun really pleased with the quality of this product. Excellent piece of kit to make sure your shotgun stays safe. My husband is very pleased with this product.Very good value for money.